This is part 2 of a four-part series about women in fields of science, technology, engineering and math (STEM). At King County March is proclaimed Women’s History Month. Historically, careers in STEM fields have been male-dominated. In the Water and Land Resources Division, 45 percent of the nearly 400 employees are women representing the STEM fields — the expertise needed to provide clean water and healthy habitat for all of King County. We asked a sampling of our ecologists, biologists, engineers, planners and landscape architects how they pursued a career in a historically male-dominated field and what advice they might have for other women. Beth leDoux is the technical coordinator for the Snoqualmie Watershed Forum and works in WLRD’s Rural and Regional Services Section. Alison Schweitzer (née Sienkiewicz) is a stormwater pollution prevention inspector in the Water Quality Compliance Unit of WLRD’s Stormwater Services Section. She has a Bachelor of Science in environmental science and a Bachelor of Arts in environmental studies from the University of Washington. “I perform pollution prevention visits at all commercial businesses within unincorporated King County,” said Schweitzer, “providing education and technical assistance to businesses and property owners to identify and mitigate potential pollution discharges. Olivia Wright is an engineer in WLRD’s River and Floodplain Management Section where she provides technical and engineering support for river and floodplain management programs and projects. Olivia is a transplant from Atlanta, GA who holds a master’s degree in environmental engineering from the University of Washington. Jo Opdyke Wilhelm is an environmental scientist with WLRD’s Ecological Restoration and Engineering Services Unit. She has a bachelor’s degree in biology from Macalester College and a master’s degree in aquatic ecology from the University of Michigan. 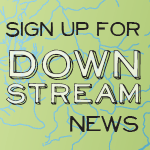 “I design, permit, implement, and monitor stream, river and nearshore habitat restoration projects with teams of restoration professionals in King County,” said Jo.